1. In a small saucepan, warm the milk over moderately low heat until it's 95°. Pour the warm milk into the bowl of a standing electric mixer fitted with the dough hook and stir in the sugar and yeast. Let stand until the yeast is foamy, about 5 minutes. Add the softened butter, eggs, grated lemon zest and sea salt. Add the flour and beat at medium speed until a soft dough forms, about 3 minutes. Increase the speed to medium-high and beat until the dough is soft and supple, about 10 minutes longer. 2. Scrape the dough out onto a lightly floured surface and knead it with your hands 2 or 3 times. Form the dough into a ball and transfer it to a lightly buttered bowl. Cover the dough with plastic wrap and let stand in a warm place until doubled in bulk, 1 to 2 hours. 3. Line the bottom of a 9-by-13-inch baking pan with parchment paper, allowing the paper to extend up the short sides. Butter the paper and sides of the pan. Turn the dough out onto a lightly floured work surface and, using a rolling pin, roll it into a 10-by-24-inch rectangle. 4. In a medium bowl, toss the frozen raspberries with the sugar and cornstarch. Spread the raspberry filling evenly over the dough. Tightly roll up the dough to form a 24-inch-long log. Working quickly, cut the log into quarters. Cut each quarter into 4 slices and arrange them in the baking pan, cut sides up. Scrape any berries and juice from the work surface into the baking pan between the rolls. Cover the rolls and let them rise in a warm place until they are puffy and have filled the baking pan, about 2 hours. 5. Preheat the oven to 425°. 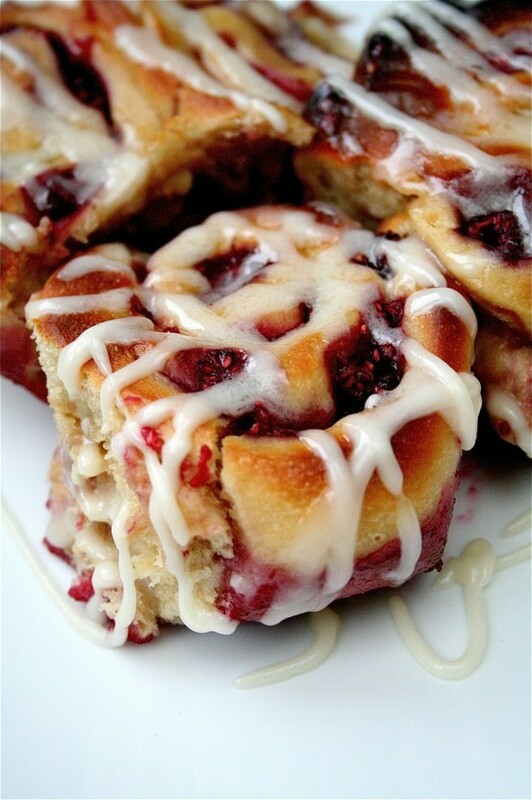 Bake the rolls for about 25 minutes, until they are golden and the berries are bubbling. Transfer the pan to a rack to cool for 30 minutes. 6. In a small bowl, whisk the confectioners' sugar with the butter and heavy cream until the glaze is thick and spreadable. 7. Invert the rolls onto the rack and peel off the parchment paper. Invert the rolls onto a platter. Dollop glaze over each roll and spread with an offset spatula. Serve warm or at room temperature.